When we think of Europe most Americans think of fashion, quaint cafes, the Eiffel tower, fascinating architecture and endless historical sites. But history thinks of Europe very differently… Europe’s past is the location of massive wars, ethnic cleansing and brutal concentration camps. Europe’s history of fighting is far from over. Europe remains a small continent, fragmented into many parts and crowded with many ethnically dissimilar nation-states. It has a history of resentment and bitterness and ethnic violence. Europe’s anger against other Europeans is still very much alive. The fact is all nations have memories, and all but the most powerful nations feel wronged by some crime that cannot be made right. This will help you understand Europe today and why there will be future European wars. Suffering on the continent over the past 100 years has been staggering. For example Poland in the past has been brutalized by both Russia and Germany; the Serbs killed thousands of Croats and Bosnians in the decade of the 90s; and during World War II the Ustaše regime in Croatia viciously killed thousands of Serbs at the Jasenovac concentration camp outside of Zagreb. Revenge killing is a well-known modus operandi in Europe. No nation really trusts others. Friendships between nations are shallow and superficial at best. Over the years France has been repeatedly invaded by Germany; the British do not trust the French, the Greeks despise the Germans…Germany believes it must protect itself from Russia and western Europeans. In Belgium the Walloons do not trust the Flemish, the Flemish look down upon the Walloons; the Greeks despise the Turks, the Turks believe they are part of Europe, when no one else in Europe believes Turkey should be considered European. And lets not forget…the Hungarians and Romanians dislike one another immensely. The differences and old wounds are almost endless when it comes to Europe. Old wounds have a way of reopening. War will be part of Europe’s future—the old wounds will chafe again. Let’s not forget that the First World War was essentially European; 16 million people died in World War 1, most of the dead were Europeans. The Second World War was truly global, but it was Europe that suffered the most during World War II. No one can be certain of exactly how many died in Europe in World War II, but a conservative number is 51 million, this included soldiers and mostly civilians. In 1939, Europeans numbered about 550 million. 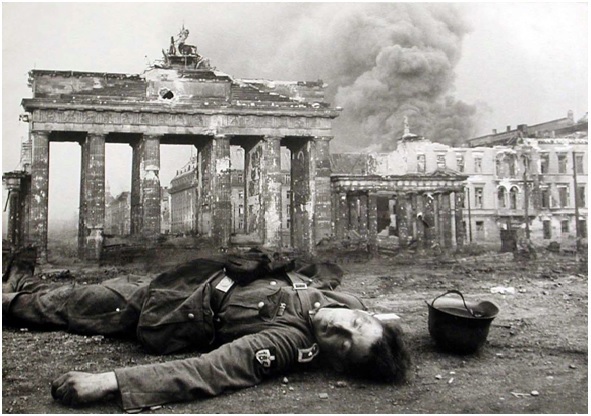 An astounding 10 percent of all Europeans perished during the six years from 1939 to 1945. But numbers do not capture the awfulness of war—the starvation, millions killed, the sadness, and the fear, the millions of orphans. Poland lost over 16 percent of its population during the 2nd world war, Germany more than 10 percent; the Soviet Union lost 14 percent. The greatest losses took place in the “Bloodlands” of Eastern Europe; Poland and the area we call today Belarus were hit particularly hard. Between 1942 and 1947, 17 million people died in Eastern Europe, killed by Stalin or Hitler. By Eastern Europe I mean the general area that encompasses what is now Poland, Latvia, Lithuania, Estonia, Belarus, Ukraine, and western Russia. But even countries to the west like France lost half a million, and Italy and Britain lost almost a half million during the 2nd world war. Geopolitical analyst George Friedman sums up the devastation that overtook Europe this way in his outstanding book, FLASHPOINTS, “combining the 55 million dead from World War II and over 16 million from World War I, in the thirty-one-year period from 1914 to 1945 approximately 71 million Europeans died in general warfare. When you add roughly 20 million killed or starved under Stalin, the number rises to 91 million. Add in the Russian and Spanish civil wars, and sundry other conflicts hardly worth mentioning, such as Turkey’s war with Greece and Armenia, and the number of 100 million is conservative. And there have been recent European wars. In the Balkans, there were about a quarter of a million casualties in the 1990s thanks mostly to the aggression of Slobodan Milosevic a Serbian and Yugoslavian president. The term ethnic cleansing originated in former Yugoslavia in the 90s. It bears repeating… all nations have memories, and all but the most powerful nations feel injured by some wrong that cannot be made right. This is especially true of the Balkans. By the Balkans I am talking mostly about former Yugoslavia. Catholic Slovenia and Croatia, Orthodox Serbia and Macedonia, and Bosnia-Herzegovina (thought of as Muslim but with a large Serbian Orthodox population) these merged together into a temporary nation whose ethnic hostilities boiled beneath the surface; this became the communist state of Yugoslavia headed by Marshal Josip Broz Tito who suppressed in-house ethnic conflict with an iron fist. But he died and 25 years ago the Balkans erupted into a vicious war. The Balkans is important to European history. We should remember what Bismarck said in 1888: “If there is ever another war in Europe, it will come out of some damned silly thing in the Balkans.” How prophetic that statement was. When Gavrilo Princip, a member of “Unification or Death,” a Serbian group, assassinated Archduke Ferdinand and his wife in Sarajevo (Bosnia) in 1914, it set in motion the 1st world war. Today the nations of former Yugoslavia (Croatia, Slovenia, Bosnia-Herzegovina, Serbia and Kosovo) are at peace, but the peace will not last long. As we have learned over the centuries, in the Balkans peace is fleeting. The European Union intended to achieve what the Romans, Charlemagne, Napoleon, and Hitler had all failed to do: create a united peaceful Europe. Today Europe is relatively peaceful. But Prophecy tells us it will not remain that way. The peace in Europe today is simply the calm before the storm. Keep in mind that conflict in Europe can occur quickly. Let’s not forget the recent past. Germany was weak, divided, and barely armed in 1932. By 1938 it was the great military power on the Continent. Nightmares can come to pass quickly. In the not too distant future– we are told that political turmoil in Europe (Revelation 17), will lead to a newly formed confederation of states that will be beastlike (terribly destructive). We are told in the book of Daniel, that God often removes and sets up leaders according to His purpose and insights: Daniel 2:21– He controls the course of world events; He removes kings and sets up other kings…thus we watch Europe with this in mind, and with intense interest!